Search engine optimization has become an essential part of any company’s internet marketing strategy, with millions of website owners competing for the top spot on Google and other major search engines. Ranking higher in Google has a significant number of benefits to consider – any website owner, regardless of their website’s purpose, can benefit from ranking higher in search engines. A higher ranking leads to more targeted traffic that is often considered relatively easy to convert, especially when a web page ranks for the right keywords. Unfortunately, even though search engine optimization has such potential, it can be very difficult to hit that number one spot on Google and it can also be very costly. There are, however, some strategies that can be utilized to help a company get their website to rank higher in search engines without having to pay thousands of dollars on a monthly basis. While writing more quality content on the website’s blog and building more backlinks on pages with high ranking factors are excellent methods to be utilized, social media has recently also gained grounds in bringing about better rankings for websites. Firstly, we should note that website owners need to realize that their activity on social media channels, such as Facebook or Google Plus, does not have any direct effects on their search engine rankings and will not directly improve search rank for a website, as reported by Orbit Media. This, however, does not mean the effort you imply on your company’s social media marketing strategy has no effect on your search engine rankings at all. Let’s explore how social media efforts affect search rankings, and why you should start implementing different types of social media for SEO strategies to help your website gain a higher rank in Google. Google+ is a relatively new social media network that was introduced by the big giant in search engine technology, Google. Since this social network was built by Google and is integrated with the Google app suite, it also means what you do here can be tracked and monitored by Google. In turn, this can greatly affect how your website is seen in Google’s search results in more than one ways. First of all, it should be noted that Google now personalizes the search results provided to a user who is logged into their Google+ profile when one of their contacts shared content related to their search phrase. This particular factor is already very beneficial since it can help to get your website at the top results for some people. Additionally, Google+ posts also show up in Google’s search results. Groove Digital Marketing explains that it is essential to start by setting up a professional profile page – not only for your business but also for your personal account. The more you network and connect with others, the higher chance that your contacts will see your posts high up in their search results. Even though a thousand shared on the latest post you shared on your Facebook business page won’t get you to rank number one in Google, it can help to expand the reach of that particular post. When people start sharing a link you have posted to your website, it means more people will see it. The more people reached with such a post, the more potential there is for new visitors to land on your website from the social media channel where you shared the post on. In turn, this will increase the visitor count of your website, show Google that your website is popular within its niche. You share a post on your company’s Facebook page. One of your page’s followers notices the page, considers it useful and decides to share the post on their personal wall. In turn, one of their friends see the post – this person has their own blog with a high DA (Domain Authority). They then decide to link to your site and may even use your website as inspiration for a new post. While one link may not seem like much, imagine such a scenario happening more than once to every link you post on your Facebook page – the backlinks obtained from simply sharing links to your website can quickly add up and give you a significant boost in Google. This may even lead to blogger outreach and influencer marketing opportunities, which further boosts your position in search engines. As we have already discussed, social shares and other activity on social media channels have no direct effect on how high your website ranks in Google or another search engine. While this is true, it should also be noted that likes, shares, and comments, also called social signals, can cause Google to notice an increase in popularity of your website. Cognitive SEO recently completed a study where they monitored 23 million social shares in total. What they found was that the top four positions in Google tend to have a significantly higher interest in social media, featuring more shares, likes and comments; thus leading to the conclusion that Google does, indeed, notice an increase in popularity when social signals increase. Lastly, we want to note that setting up a post on social media that goes viral may be noted by authorities in the media industry. For example, one of your posts may be noticed by a journalist writing for Huffington Post. The journalist may become interested in what your post was about and what your business has to offer customers. This could lead to gaining as much as an entire article focused on your particular business. In turn, you gain a valuable backlink and also a lot of visitors; thus leading to two factors that will positively affect your ranking. 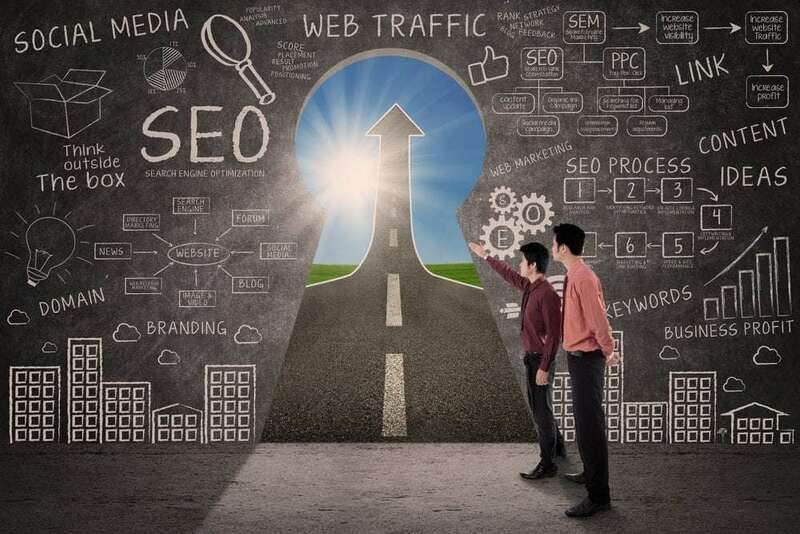 As paid advertising is getting more competitive and often also more expensive, many companies are turning toward more effective search engine optimization strategies to help them drive more organic traffic to their websites. Search engine optimization can also be costly and competitive, but with the right strategy, it is possible to rank higher than the competitors by simply implementing highly effective strategies. In recent times, social media has been proven to assist with SEO in several ways – even though not directly. In this post, we shared some of the most important reasons why your company should start to implement a social media marketing strategy as part of its search engine optimization campaign starting today, if not already.